The soccer craze is taking over Minnesota and Ticket King is ready to get you in the action. Our Minnesota United soccer team has a brand new stadium just off 94 in St Paul and Ticket King has the Allianz Field tickets you want. Ticket King has been a proud supporter of Minnesota United Soccer from the beginning and now with a brand new stadium, we are excited to pack the stands with soccer fans! 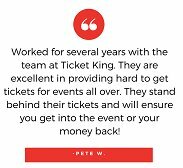 Buy MN United tickets from a trusted source, Ticket King. If it's here, we're the ticket! Buy Minnesota United Soccer Tickets Now! Buy tickets with 100% confidence! We don't charge extra checkout fees like the other guys. The price you see on the first screen is the price you pay. Please enter a name and valid email.